Not actually all the bad, given the circumstances. There's the self-designed sweater that needs only a sleeve to be finished (and the pattern needs to go out to testers by Friday, but that's a different problem). This is the key project for tomorrow's7.5 hr flight, and I'm hoping to land in Boston with a mostly finished sleeve. There's the August socks, which are lagging woefully behind. I was making good progress, but had to rip everything out and start on smaller needles to get something that might vaguely fit my foot. However, that means they're now being knit on US 0/2.0 mm needles. Metal needles. I know they're technically allowed, but given that my last trip with metal pointy sticks resulted in my being held up at security for a while, I think these will be going in the hold instead. Third up is my guilty project: the Dahlia Cardigan from the latest issue of Interweave Knits. I couldn't help casting on this weekend, but I've finished the interesting bit (the lace panel on the back). I predict that this one is going to languish now that I've hit the stockinette stage, but maybe it will be good car knitting. This one is also on metal needles, so it will get packed in the checked bags. Hopefully TSA is a bit more understanding/less paranoid about metal needles then the Brits, so I can work on it on the way home. Lastly, I've packed a spinning project: My oldest remaining Hello Yarn Fiber Club stash, from June 2009. This is Shetland in the colorway "Sour Fig". And my trusty Golding spindle. I haven't tried a spindling project on a trip before, and I'm looking forward to it. I think I'm going to try a 6 strand cable with this fiber - three 2-ply yarns plied together. Means I need to split up the fiber by weight before we leave though. Another item for this evening's list. I'm looking forward to some quality family time, both with the girls and Himself, as well as with various (grand)parents, brothers/sisters (aunts/uncles) and friends. Happy August! 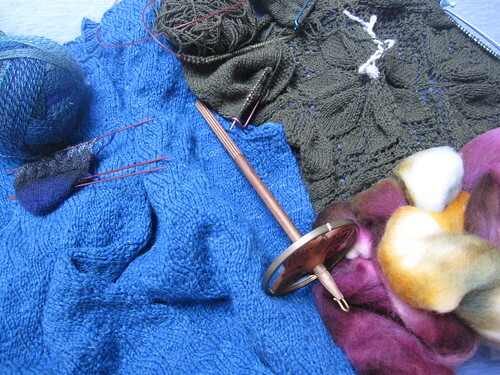 Written by porpoise On August 16, 2011 In "11in2011", "designs", "fiber club", "socks", "spinning", "travel"